Gizmodo's "Best Books of 2013" list has just been posted and includes three contributions from your humble blogger of all things retrofuture. 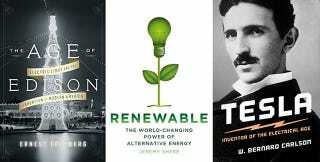 Included on my list is the new Nikola Tesla biography by W. Bernard Carlson. It really is the best Tesla biography ever written and avoids the hero worship that has unfortunately tainted most other books about the man.